News of a new book from Susan Mallery is always cause for celebration here at TRD but news of a new series that's kicking off with a pre-publication 16-stop exclusive excerpt tour complete with a fabulous California Dreamin' prize package at each stop? Well, that sends the excitement level right off the charts! 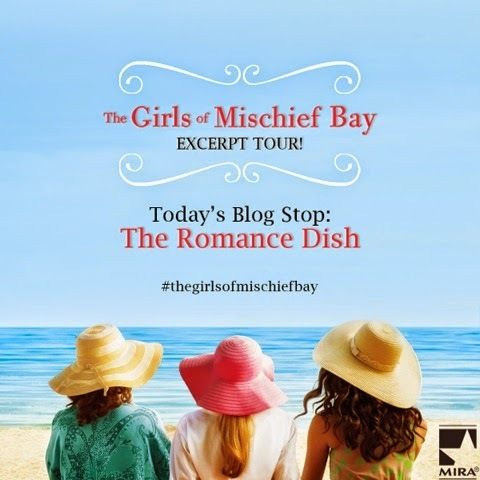 Here's the blurb for the first book in the new Mischief Bay series, The Girls of Mischief Bay, followed by our exclusive Excerpt #5. She headed into the kitchen and flipped on the wall-mounted TV. John got home between five fifteen and five thirty every day. They ate at six—a meal she’d made from scratch. Every Saturday night they either went out to dinner or had an evening with friends. Sunday afternoon the kids came over and they barbecued. On Memorial Day they held a big party, also a barbecue. It was L.A. When in doubt, throw meat on a grill. She automatically collected the ingredients for biscuits. Self-rising flour, shortening, sugar, buttermilk. She’d stopped using a recipe years ago for nearly everything. Because she knew what she was doing. John liked what she served and didn’t want her to change. They had a routine. Everything was comfortable. She measured the flour and told herself that comfortable wasn’t the same as old. It was nice. Friendly. Routines meant things went smoothly. She finished cutting in the shortening, then covered the bowl. That was the trick to her biscuits. To let them rest about twenty minutes. Lulu sat patiently next to her bowl. As Pam approached, the dog wagged her fluffy tail and widened her eyes in a hopeful expression. Lulu gave a bark, then followed her to the refrigerator, where the can waited. Lulu’s diet was an on-going challenge. She was small so didn’t need all that much. She had allergies and skin conditions, not to mention a sensitive stomach. Which meant she ate prescription dog food, consisting of a “novel protein” diet. In her case, duck and sweet potato. Pam stuck a quarter cup of water into the microwave and hit the start button. After measuring out the right amount of canned food, she swapped the plate for the measuring cup, then started the microwave again. Hot water was stirred into kibble. Lulu had delicate teeth and couldn’t eat regular kibble. So hers was softened with hot water. They went through this ritual every night, Pam thought as she held out the bowl. Lulu immediately sat, as she was supposed to, then lunged for the bowl and devoured her meal in less than eight seconds. Lulu was too busy licking her bowl to answer. Pam rolled out the biscuits and put them on the cookie sheet. She covered them with a clean towel and started the oven. She’d barely finished setting the table when she heard the faint rumble of the garage door opener. Lulu took off running down the hall, barking and yipping in excitement. A few minutes later John walked into the kitchen, their ridiculous dog in his arms. Pam smiled at him and turned her head for their evening kiss. As their lips touched, Lulu scrambled from his arms to hers, then swiped both their chins with her tongue. “How was your day?” John asked. As he spoke he crossed to the bottle of wine she’d put on the counter in the butler’s pantry off the kitchen. It was a Cab from a winery they’d visited a few years ago on a trip to Napa. As they spoke, she studied the man she’d been married to for thirty-one years. He was tall, just over six feet, with thick hair that had started going gray. The dark blond color meant the gray wasn’t noticeable, but it was there. Being a man, it only made him look more appealing. A few months ago he’d asked why she wasn’t going gray, too. When she’d reminded him of her visits every six weeks to her hair person, he’d been shocked. John was such a typical guy, it had never occurred to him she colored her hair. Because he thought she was naturally beautiful. Silly man, she thought affectionately, as she watched him. He had a few wrinkles around his eyes, but otherwise looked as he had when they’d first met. Those broad shoulders had always appealed to her. These days he claimed he needed to lose ten or fifteen pounds, but she thought he looked just fine. He was handsome, in a rugged kind of way. He was a good man. Kind and generous. He loved his wife and his kids and his routine. While he had his faults, they were minor and ones she could easily live with. In truth, she had no complaints about John. It was the her-getting-older thing she found faintly annoying. He pulled out the cork and tested it with his thumbnail, then poured them each a glass of Cab. She slid the biscuits into the oven and set the timer. “What are we having?” he asked as he handed her a glass. He wasn’t kidding, she thought as she followed him through the kitchen. His idea of heaven was any kind of red meat with leftovers for lunch the following day. He was easy to please. They went into the sunroom off the back of the house. In the cooler months, the glass room stayed warm. In the summer, they removed the glass and used the space for outdoor living. Lulu followed them, then jumped up on the love seat where Pam always sat and settled next to her. Pam rubbed her dog’s ears as John leaned back in his chair—a recliner with a matching mate in the family room—and sighed heavily. Want to know what happens after Excerpt 5? Me too! chance to win a prize package at each stop. Tell me about your girlfriends. Are they life-long? Newly acquired? What makes them special? Have you ever taken a girlfriend trip to the beach? If you had the opportunity, to what beach would you head? One randomly chosen person who leaves a comment (including your email address) on today's post will receive the following California Dreamin' Prize Package put together by Harlequin. Mallery lives in not-so-sunny Seattle with her husband and a toy poodle who makes her laugh every day and who’s not even a little bit impressed by her growing fame. I have read a few of Susan's books and enjoyed them. I am looking forward to this series. A circle of friends adds a richness to life and helps you make it through difficult times. thanks for the excerpt. Nice set up for these characters. Will be interesting to see what happens to their perfect relationship. The prize package is a delight and will be handy for the winner this coming summer. Most of my good friends ( from high school and the military "family") are scattered all over the country. We see each other mainly at reunions or when we travel through where one may live. What is great about them, is no matter how long it has been since we last saw each other, it seems like only yesterday. We pick up where we left off and have a great visit. Never did take a girlfriend beach vacation. We were always busy with school or our families. I'm not much of a beach party person. I did take a trip to our families camp on a small mountain lake to spend a weekend with some friends without family. We had a great time, even though we were less than an hour from home. We enjoyed what the lake had to offer and didn't have to worry about younger siblings getting in the way. My idea of a beach to visit, would be an uncrowded one on a small lake. I have been to many of the beaches in Florida, Myrtle Beach, SC, and some on the Northeast coast. Too crowded for my taste. 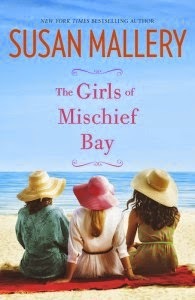 I hope the release of THE GIRLS OF MISCHIEF BAY is a big success. Isn't that the best, Pat, when you get together with friends you haven't seen in a long time, and it feels as comfortable as ever? There are friendships that transcend time and distance. Thanks so much for your kind words about THE GIRLS OF MISCHIEF BAY. I appreciate your well wishes! I love Susan's books.I've never had a beach day with my friends but I'd love the idea. We're about half an hour from the shore so we'd have our choices off what lakes to go to..
A half hour from the shore sounds wonderful! Congrats to Susan on the upcoming release. I'm a big fan of the Fool's Gold books, but Accidentally Yours was the book that first made me a fan. Most of my good friends are the ones I've met during high school, college and from my various jobs. I loved Accidentally Yours! It wasn't my first Mallery book but it's still one of my favorites. I started reading Susan's books in the early 2000's when she had a series of sheik heroes. I enjoyed her Marcelli winery series and Buchanon family series, the Sweet bakery trilogy, many of the Fool's Gold series, and her Texas series. My favorite is the Marcelli California winery series. Girlfriends I keep in touch with 7 friends from HS As we live in different states with over 1500 miles in between I can not do all the things they schedule. They routinely go to Door County a few times a year and celebrate birthdays. They also meet in my hometown a couple times a year, even though only one of them actually lives there. They go to summer concerts in the park and Milwaukee's annual Summerfest and sporting events :Badger, Brewer and Packer games too. I have 2 close college girlfriends. We are only able to talk via Facebook and cards. We do not get-together any more. Newly acquired -over the past 7 years I work part time. I've made friends but they are more socially related. I don't have the deep bond yet. We get together for coffee, a movie or drinks. One, Connie, is the sweetest, most caring person I have ever met, her heart is pure gold. Friends are special because they know you: your likes and dislikes, your worries and your family history and your family members . They help you get through the low- rough patches and share the joy of the highs. They always have time for a call, or to answer a question/give advice, or to give an encouraging smile, or to offer a heartfelt kiss. Yes. We went on a girlfriend trip to Sister Bay, Wisconsin in Door County. We share our lives. We have a few drinks. We go out for dinner. We relax. We swim,. We read. We talk. The easiest beach for us all to meet is Nashotah Park Beach on Lake Michigan when we visit our hometown. How wonderful that your high school friendships have remained strong. I grew up in a small town with close friendships that were formed in early grade school. We went through so much together but after graduation, many (including me) moved away to other states and over the years the friendships were lost. I've reconnected with some through Facebook but have no idea where others landed. I really regret that. Oh, that sounds lovely, Laurie. Lakes are so nice. I love the ocean (obviously, since I'm creating an entire series set in Mischief Bay, which is on the ocean), but there's something really wonderful about freshwater lakes. I hope you'll get to see your friends again soon. 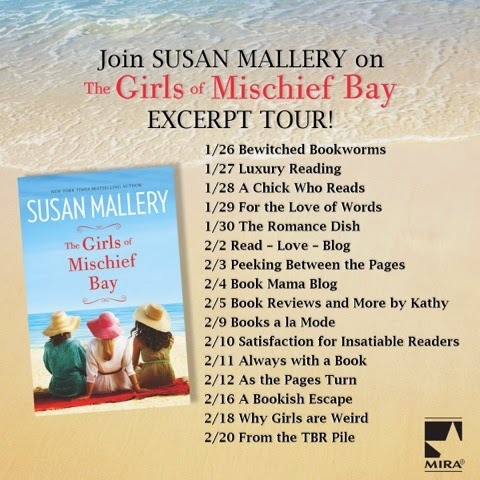 I'm looking forward to visiting Mischief Bay. I recently purchased When We Met, Before We Kiss and Until We Touch. I read your books during my work lunch hour. I just finished The Christmas Wedding Ring. I'm so glad that Molly and Dylan managed to realize what they had together! You must leave your email address with your comment to be included in the prize package drawing. Have you read Susan Mallery's books? You are kidding, right. LOL. Probably almost all of them. Do you have a favorite Mallery book or series? Hard to pick, but the Bakery series and The Buchanan series. Tell me about your girlfriends. Are they life-long? Newly acquired? What makes them special? Some lifelong, some newer. We share similar likes and they are all kind, caring and funny people. Have you ever taken a girlfriend trip to the beach? If you had the opportunity, to what beach would you head? Yes, Atlantic City Beach. I'm a long-time Susan Mallery fan too. I love the Marcellis, but my favorite Mallery books are Two of a Kind and All Summer Long from the Fool's Gold series. An oldie--The Bodyguard and Mrs. Jones--is another favorite, and I was delighted to learn that it is being reissued in a digital version next month. I'm not much of a beach girl, although I grew up spending lots of time with my friends at a huge man-made beach a few miles from my home. These days, given my druthers, I head for the mountains. I do love the history of Jekyll Island, but fall rather than summer is my favorite time to visit. I like Jekyll Island too, Janga. I'll be near there (Sea Island) next fall for a wedding. Looking forward to a return visit. Thank you, Janga!!! You've named two of my favorite Fool's Gold books, too. You know, I was quite nervous about TWO OF A KIND. I thought readers might find Felicia's genius a little off-putting, but the overwhelming response has been that she's one of readers' favorite characters ever. I have enjoyed Susan's stories over the years, a favorite being a series with chefs but I don't remember the name of it. I haven't taken a trip to the beach with just friends since I had my kids but when I was young it was definitely a fun thing to do. I am a longtime reader of Susan's books. My favorites are some of the "old" ones, like the Marcelli Sisters and the Buchanans series. Newer books that I enjoyed are Three Little Words and Christmas on 4th Street. I love going to the beach, but I have never gone with girlfriends. It sounds like it would be fun! Louise Risser twizone1@comcast.net I have read Susan's books for quite a while. My favorites are the Buchanan family series. And another vote for the Buchanans! Thanks for stopping by today, Louise. I do hope you'll give her a try, catslady. She has some wonderful books! I don't know what I would do without my girlfriends. I love my husband dearly, but sometimes you just need a little girl time. I was introduced to Susan Mallory with her Marcelli Sisters and then I found everything she wrote. One of my fav writers. I do not miss any of her new books. I have a group of the best BFF's. We have been together for more than 30yrs. We have spent many great times together and sun sea and sand have been involved a few times. How wonderful to have that much history together, Kathleen. You're so sweet, Kathleen. Thank you for being such a loyal reader. :) I often feel that when readers tell me they love my books, they're saying, "I love your heart, and I love your brain." There's a piece of me in each book that I write, and it's an honor that you allow me to take you on an emotional journey time and again. Isn't the internet a wonderful invention? Not only does it allow me to keep up with friends easily but I've made treasured friendships with people I've met because of it! So true, PJ! The internet has made the world a much smaller, more accessible place. It's so much easier to keep in touch with friends far away. Oh wow, that sounds amazing!!! I'm glad you had fun. Very cool that you saw so many whales. What an incredible sight that must've been. Just reminds you of the diversity of our planet. I haven't read any of Susan Mallery's books yet but this one really appeals to me. I have a group of girlfriends who are more like sisters to me. Their kids even call me Auntie! I've known two of them since I was a kid and one of them I just met in the last 10 years at work. We are always there for each other, even when we live far apart. That's what Skype is for! I've been on two beach vacations with my girlfriends. One was for my best friend's wedding in the Caribbean and the other was a girls week in an all inclusive in Cuba. Such fun! I have a couple friends like that too, Susan. Your girlfriend getaways sound great! Wow, Susan! Those trips sound like the most fun ever! Very, very cool. Makes me feel like I need to start planning a girlfriend get-together soon. As soon as I finish writing the second Mischief Bay novel, which I'm working on now. Key West definitely qualifies! Hope you can make that getaway happen one of these days. Florida has some beautiful beaches, especially along the west coast and panhandle. I spent time in Destin with a group of girlfriends a couple years ago. Gorgeous beaches and stunning sunsets. I have read a few of Susan's books I have a friend that I have known since we were six and new girl friends I have only known a few years. I love, love, love the beach. I wish I could go at least 3 or 4 times a year. I do try to make it down at least twice a year. My favorite beach area is along 30-A in the Florida panhandle. I adore Seaside, Seacrest and Rosemary Beach. The sugar fine white sand and emerald green waters are gorgeous. They have gorgeous beaches in that area. I lived in southwest Florida for several years and spent my beach time on Siesta Key Beach, frequently named one of the most beautiful beaches in the world. Awesome giveaway! Love Susan's books, I really enjoy the beach but don't get to go there aften. My best friend met when we were five years old. Wow, friends since kindergarten! That is really something. Just precious. I love the Fool's Gold series by Susan. My favorite is the Fool's Gold Series. I love Myrtle Beach in South Carolina but it's been a few years since I was there with one of my friends. I have a few friends that I have had since Elementary School, it would be fun to go back and enjoy the beach now that we are older. It really is astonishing how time just drops away when you get together with longtime friends. I started reading Susan Mallery this year. I'm enjoying the books very much due to the rich character development and obvious affection of the author for her characters. My friends are, unfortunately, far from me, here in AK. We are still close and I embrace our friendship. I have 2 favorites in the Fool's Gold series Ford is one & The voice of the radio station Gideon? with the smart girl. Yes I have girlfriends never been to the beach with them. The only girlfriend who has been there thru thick & thin is my Mother. We've been to Myrtle Beach. Mom wanted to go back, take a trip down memory lane after my dad died. as I never got to go with them. Now I would chose a beach in Texas, Galveston Beach. My brother works in Texas we would be close enough to visit. No-one has your back like a parent. She is the girlfriend I choose 1st always! Tinna Doub, aunttl2001@yahoo.com thanks for the chance. Have a great day! That is so sweet, Tinna! What a blessing, to have such a close relationship with your mother. I love all of Susan's books but my favorite are the Fool's Gold series. Each time I read one it's like going back to visit old friends and find a few new ones. I was so excited to hear that Susan was starting a new series, with a whole new group of characters to enjoy. The only beach I've been to is on Paradise Island, Bahamas when I won a radio contest for an all expense paid 4 day trip. It just happened to be my 15th wedding anniversary and it was perfect. That must've given you a lifetime of memories to treasure! Wow, congratulations, Brenda! I do enjoy Susan's books - especially the series like Fool's Gold and the Lone Star Sisters. Love to go stay at the beach - usually go with family - favorite is Isle of Palms just outside Charleston SC. Thank you, Di! :) I hope you'll join my mailing list at www.susanmallery.com so I can send you an email when I release a new book! My bestfriend and I met when we were 10 years old, we are now in our 50's. In high school, she took up cosmetology and I was her "practice dummy" for all her tests. We have had a great friendship that continues to grow. I love her like a sister. Oh my gosh, I want a friend to do my makeup every day! LOL!!! I've had the same circle of friends since high school. I'd love to take a girls' vacation to a warm beach!!! Probably somewhere in Hawaii or the Caribbean :) I have several of Susan's books in my TBR pile. Definitely going to have to bump them up. Thanks for the awesome spotlight! Thank you, Erin. I hope you get somewhere warm someday soon. I have read a bunch of Susan's books & series! I loved the Lone Star Sisters, Marcelli Family & of course, Fool's Gold! I have one friend that I have known since kindergarten. I am in NY & she has moved to CA, so we don't really get together, but keep in touch. I have gone on a beach vacation to Aruba with a friend & also have gone to Ft Lauderdale with girlfriends. Love Susan's books. Can't wait for her new ones. My BFFS and I have been on many trips, but never to a beach unfortunately! A side effect of living in Kansas, haha! I haven't read anything by Susan yet, but I hope to soon! Thanks for he chance to win! I've read many Susan's books. My favorites are from the Fool's Gold series. I have read most of her books, but not all of them (yet). I love Fool's Gold series and I can't wait to get into a new great series! I love Susan's books. I can't wait to read this book!